Besides being tasty, it's a probiotic full of antioxidants. Drinking kombucha regularly can aid in digestion and body detoxification. I first tasted kombucha a few years ago at a raw vegan potluck. It was a homebrew and tasted overwhelming to me. I wasn't sure I would ever have it again. Awhile later, I ran across some GT's and gave it a try. I was more intrigued this time and began trying all different kinds and flavor combos. I began to realize that kombucha can be mild or really overwhelming. It just depends on who is brewing it and what their preference is. Now, my family and I are all hooked and we drink quite a bit of it at home. Buying and drinking bucha everyday can get really expensive, really quickly, so I decided to make my own. It seemed a bit intimidating at first, but now after I've done a few of batches, it's not that involved at all. Before you began brewing bucha, you will need a SCOBY. A SCOBY is a Symbiotic Colony Of Bacteria and Yeast. It also goes by the name Mother or Mushroom. You can get one from someone else who brews at home or order one from the internet. You can also grow your own and that's what I did, using these instructions. I'm wearing gloves because I had just washed and oiled up my hands before I decided to do this and I didn't want to wash the oil off my hands. 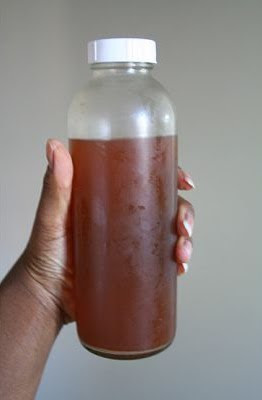 You don't want to introduce any oils or other foreign particles to your SCOBY or brew. After you secure a SCOBY, you can start your bucha brew. I read through a few recipes on both the single and double fermentation method. I've done both ways and both have turned out good. I like the extra fizziness double fermenting gives. Food Renegade has a great recipe. It's fun to play around with different teas, juices, sugar amounts and brewing times! Tip: Try different brewing times and taste along the way to see if it's where you want it. I store in individual 16oz bottles to maintain fizziness. After brewing the basic way, I add 3oz juice to my 16oz bottles and fill the bottle the rest of the way with bucha brew. I let sit out in dark place for another 2-3 days, before chilling in the fridge and enjoying! 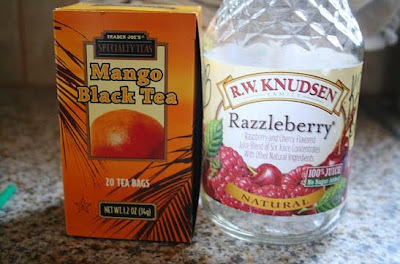 Kombucha brewers, please let me know of any delicious combos you have come up with! I just made my first batch of Kombucha this week! I brewed it for about 6 days, then I bottled it with a little pomegranate. Two days later I put the bottles in the fridge to chill. I pulled out a bottle today and drank it - it was great. I'm still stunned at how easy it was.